The Kohlmann family is big on soup. It’s on the menu a few times a month, all year long. We like our soup creamy or brothy, hearty or light, chunky or smooth, simmered all day or whipped up in a few minutes. 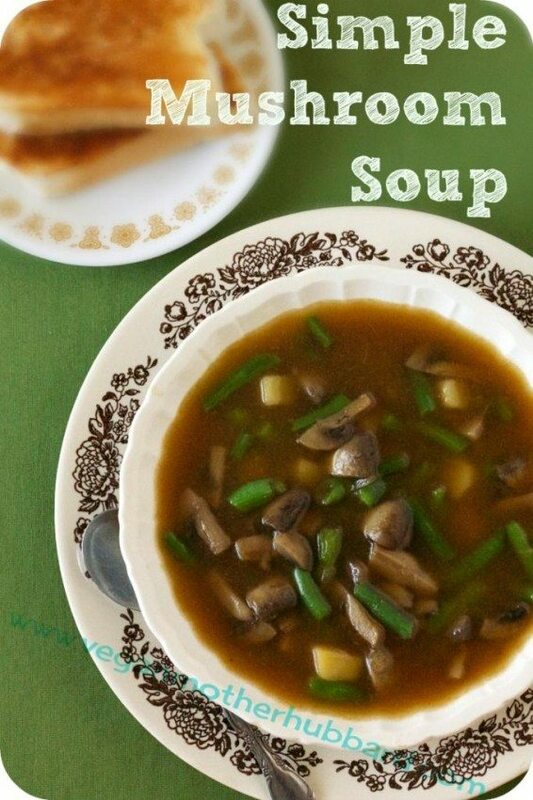 For my husband and kiddos, soup is sure fire way to satisfy at dinner time. 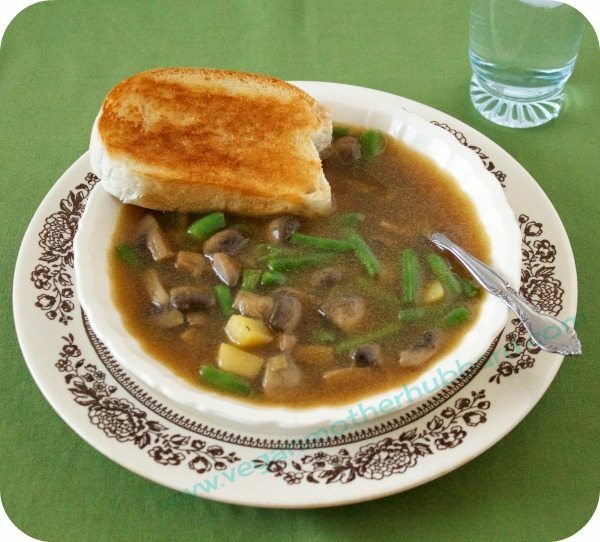 One of my absolute favorite soups to whip together is my simple mushroom soup because it’s packed with nutritious ingredients that most don’t even realize are there. 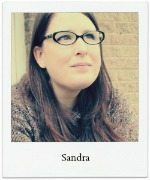 When my daughters were very small, they would eat almost any protein, grain, or vegetable, if it was served up in a bowl of soup. A one pot meal that I could load with nutritious ingredients, and satisfy a pair of 18 month olds? How could I pass that up? As the girls got a bit older, they have continued to slurp up just about any kind of soup. They will tell me they don’t like onions, then eat them without thinking, because they are in a bowl of chick & noodle. I hear, “I don’t want to eat kale!” Then I wilt some into a pot of navy bean soup, and they gobble it right up. So soup is one of those suppers I return to again and again. On those days, when I know I’ll be busy, I pick a soup recipe that can simmer on the stove (or in the slow cooker) all day. I might get a slow cooker vegetable chowder or classic split pea soup going, while I drink my morning coffee. On a day when I don’t even think about supper, until after 5pm, I gravitate toward quicker soups, like butternut squash or this Simple Mushroom Soup that I can’t stop thinking about. 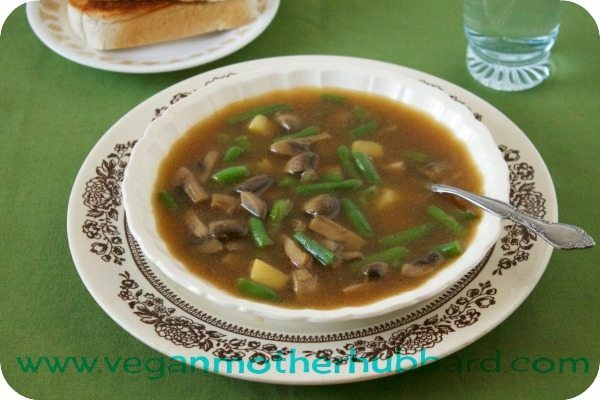 This mushroom soup is one of those recipes that you can sort of build. While the onions are sautéing, you can clean and cut the mushrooms. While the mushrooms are cooking, you can peal and dice the potato. While the broth is coming to a simmer, and the potatoes are cooking, you can bake up some garlic bread or prep a couple grilled cheese sandwiches to serve on the side. In under an hour, you can make the kind of supper that will taste great and even yield leftovers for lunch the next day. 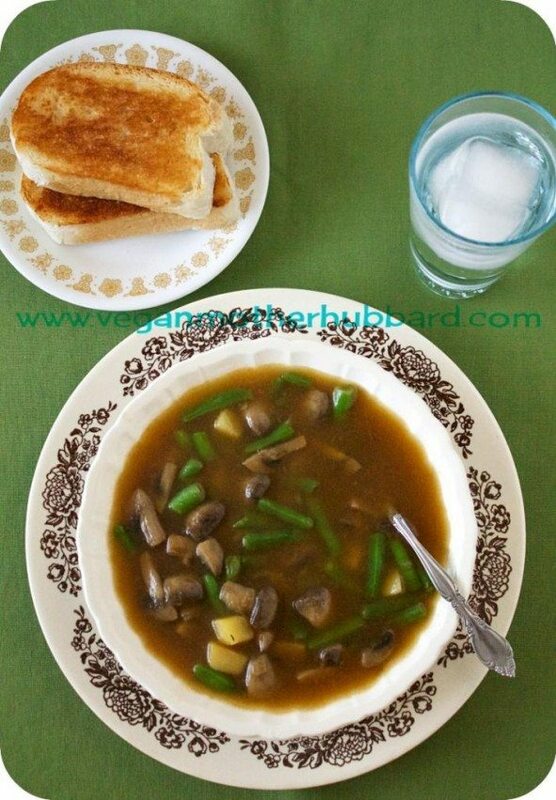 A simple mushroom soup packed with nutritious ingredients and perfect for a cold day. In a 4 or 6 quart soup pot, warm the olive oil over medium heat. Add the onion and garlic, and saute until the onions are softened and fragrant, about 5 minutes. Stir the green beans into the pot, and cook just until they are tender, 3-5 minutes. Serve with garlic bread or grilled cheese triangles. Love this soup. Easy, healthy, a crowd pleaser for sure. Thanks!